I know, it’s been a while. But I am still trekking along. 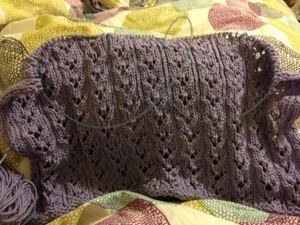 Tomorrow (I promise) I’ll have more of what’s on the needles and the results of that fiber/project diet. But for now, my progress on Shore Thing, my goal from the diet. The reward.